This is the land which was so loved by Ernest Hemingway and Karen Blixen and it remains much as it was in their days. The Masai are still there, herding their cattle, and living as they did in past centuries. Their fierce pride and strong culture survive, and so do the wild animals in almost the same abundance which so amazed the early explorers. Riding through the country on horses, we breathe the dust, gallop after the zebra which cut our path, share our camp with the Masai and are part of age-old Africa. The route avoids the clamor of tourist vans, roads and lodges. Riders are totally cut off from the modern world and life takes on the quieter, more gracious rhythms of a bygone era. Comfortable camps are set up each night by an extremely capable and amenable staff. When riders reach camp showers are hot, the beer is cold and a delicious dinner is being prepared over wood fires. This archetypal riding safari has been one of our most popular for twenty years. 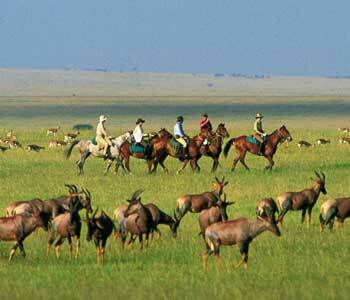 For more information see Equitours Worldwide Riding Tours.